This on-the-go essentials set is packed with everything you need to cleanse, nourish and soothe the delicate skin of babies. A travel size Little Green Baby Shampoo & Body Wash and Nourishing Body Lotion along with a full size Soothing Balm all come packaged in a convenient, re-useable travel bag… great to slip into the diaper bag, airplane carry-on, or give as gift. I had the pleasure of trying both of these Little Green Essential Sets and absolutely loved the products. The Soothing Balm works great on my kids dry elbows and knees. I applied the soothing balm for a few days and my daughters elbows and knees were no longer rough and itchy. I used the Baby Soothing Balm on my newborns lips to heal the blistering that newborns can often get when they first start breastfeeding. His lips looked better the very next day and with continued use the blistering was completely healed. The Nourishing Body Lotion made my kids skin looked hydrated and repaired and they no longer complaining about dry itchy skin. This is a great product for kids and babies with dry sensitive skin. The Little Green Kids Shampoo & Body Wash as well as the Little Green Baby Shampoo & Body Wash work wonderfully to cleanse my kids skin without drying it out. The shampoo and body wash is an all in one product making bath time that much easier. It also smells wonderful! 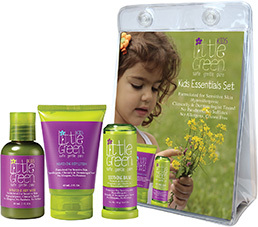 The Little Green Essentials Set would make a great gift or a great little set for traveling. Follow Little Green on social media!